Antivirus System PRO is another rogue anti-spyware program that disguises as a genuine antivirus program. Once installed, this software is designed to automatically run false scans and display false security alerts, pop-ups, which disrupt the end-user’s normal computer-browsing experience. If your computer has already been infected with Antivirus System Pro, get rid of it right away as failure to do so will result in getting your system disabled by this rogue anti-spyware. Furthermore, it will hijack and redirect your Internet Explorer or whatever web browser you are using, in order to have you purchase the program with your credit card. Please do not purchase this program as it will not protect your computer in any way shape or form. If your computer has not been infected with Antivirus System Pro, avoidance is the best strategy to staying safe from this bogus software! When visiting websites, be careful on what you click on, especially ‘executable’ (.exe) files. Most rogue-ware will automatically launch installer-scripts when either an image or an executable file is clicked on. Once the software is installed onto your computer, it installs multiple instances of Trojans and Malware, such as Trojan.FakeAlert, that generates the alerts, Trojan.Downloader, Rogue.Installer, Fake.Beep.Sys, Disabled.SecurityCenter, Malware.Trace, etc. At this juncture, you will need remote virus removal, expert assistance to fix your computer. • Antivirus Pro, Antivirus XP Pro, Antivirus 2007, 2008, 2009, Antivirus 2010, and 360. Don’t hesitate to Call the technical support experts at AdachiCompuTech.com right away if you suspect that your computer has one of the above-listed variants, or if you simply need to implement the best real time protection on your computer. Adachi Computech Solutions is your one-stop and one-click solution to remote virus removal, online spyware removal, remote computer repair, online computer support. We specialize in correcting issues that affect your computer speed and overall system performance. Our certified technicians perform these services remotely, securely, and in real-time! Today’s computers are supposed to be super-fast, but as they are being used to accomplish the day-to-day activities, especially if they are connected to the Internet, over time their speed begin to degrade often due to virus-spyware infections. In this premier part of the “Practical Tips and Tricks On Virus Removal,” this article is intended to reveal some general symptoms of virus-spyware infected computer. In today’s computing world, remote computer support is gaining popularity and undoubtedly, it is here to stay. It is now proven to be the new standard of computer repair for such systems as desktops, notebooks, servers, and connected devices. The complexity and sophistication of today’s technology have finally advanced the way computer service and support are delivered to end-users. Gone are the days whereby if your computer experienced technical issues, you would disconnect it and haul it over to a repair shop down the street where you would be promised to return for a pickup in about 48 to 72 hours, assuming no hardware replacement was needed. But today, that same computer issues can be resolved in about 1 to 3 hours or less via remote computer support accessible 24x7. You no longer need to haul your computer over to a repair shop, rather, computer repair comes to you. That’s the “beauty” of today’s technology that you and I are privileged to experience! Remote Computer Support providers can help you troubleshoot and fix your computer problems such as software errors, blue screen of death, boot up errors, slow computers, slow internet connection, system crashes, outdated device drivers, low virtual memory notifications, virus-spyware issues, web browser related issues, browser hijacks, and much more. Also, they can assist with wireless network setup and support, pc tune-up, computer optimization, online data backup, e-mail setup and support, expert software install, virus-spyware removal, windows 7 upgrade advisement, Microsoft windows and office support. How Remote Computer Support Works! Darcy Aniegbuna is a technical support expert with AdachiCompuTech. AdachiCompuTech provides remote computer support, Online PC Help, onsite computer repair, remote virus removal, online spyware removal, and gives you an instant access to a network of certified technicians available nationwide in US, Canada, UK, and Australia. Is your computer infected with PC Security 2009? Below is a known fact about this rogue program and the damage it can cause to your computer – Happy reading! PC Security 2009 is a rogue anti-spyware program that may be secretly installed onto your computer through the Trojan horse known as Trojan-Downloader.Braviax. Once installed onto your system, PC Security 2009 will infect Windows Security Center and then displays lots of misleading popup messages on your monitor screen. Generally, Windows Security Center helps to manage your windows security settings. Adachi Computech Solutions recommends you verify your security center to ensure the three security essentials are marked ON. 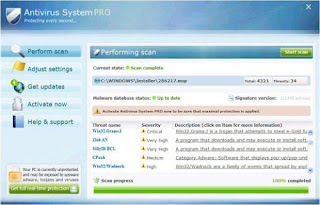 PC Security 2009 can initiate system scans that return various misleading results. Knowing when your computer is infected with PC Security 2009 is critical because it may enable you to determine the best course of action at the most appropriate time, whether you choose to isolate and remove PC Security 2009 from your system by yourself as most advanced computer users do or you seek the services of Certified Computer Technicians, who can connect to your computer remotely in less than sixty seconds via a high-speed internet to remove the rogue infections for you. However, if left unresolved, PC Security 2009 may cause serious damage to your system. In most cases, it disables and locks up key administrative tools of your computer system such as; “Add/Remove Programs” utility; “System Restore Points;” “System Registry;” “Windows Updates;” “Security Patches;” and much more! At this stage of infection, PC Security 2009 may become very difficult to detect and remove. In conclusion, Internet security suites, coupled with proactive and integrated PC tools from a reliable Technical Support Solutions provider offer important tools to keep your computers free of security threats. The aim of this posting is to educate readers and computer users on how to safely detect and remove spyware, viruses, malware, Trojans, adware, worms, and other Internet threats off their computer systems. Any information provided herein is “as is” for reference and educational purpose only. Adachi Computech Solutions gives you immediate access to remote virus removal, online spyware removal, remote computer support, and highly qualified online support experts. AdachiCompuTech.com is looking for Affiliate Partners to work with! Do you have a website, blog, an email newsletter list or ezine? If your answer is yes, then here is an easy way to monetize your investment!! We realize that many of our AdachiCompuTech.com members are looking for ways to generate additional income. If you are looking for ways to increase your revenue, we have a very good opportunity for you. You can now earn steady commissions with your website, email newsletter list or contact list, blog, by promoting several different AdachiCompuTech.com technical services. The AdachiCompuTech Affiliate Program is for individuals and companies that are highly interested in earning steady commissions by using their websites, web-logs, e-mail newsletter distribution lists, e-zines, Google ads, and other electronic marketing media to offer their subscribers or visitors the AdachiCompuTech Instant Remote Online and Live Telephone Technical Support Services. • Commission Type: Pay-Per-Sale 10% for each sale you deliver. • Initial Deposit: We’ll credit your free online account with $10.00 USD - Just for signing up! • Payout Requirements: $100.00 USD - Minimum balance required for payout. • Payout Duration: Payments are made once per month, for the previous month. We are looking forward to helping you grow your business! Delivering Comprehensive PC Tech Support Services that make owning and maintaining technology really pain-free! The launch of these premium pc support plans makes owning and maintaining technology really pain-free. With plans starting at just $14.95/month per computer, you will have unlimited remote online instant tech support and toll free live telephone access to our qualified experts 24/7. With a 12-month support plan, you will get, in addition, unlimited online (automated) data backup, commercial grade anti-virus and anti-spyware software to help keep your computer free from virus, spyware, and other security threats. Technical support services from AdachiCompuTech are delivered on-demand and take less than sixty (60) seconds to establish a connection with one of our technical support specialists. After the purchase of a support plan, your first service will commence immediately and takes 1-3 hours of thorough computer optimization and complete installation of online data backup program and anti-virus/spyware software. With a PC tech support subscription plan from AdachiCompuTech.com, you can now have all your computer and tech problems solved for one affordable monthly or annual price. For a detailed listing of our support plans, visit https://www.adachicomputech.com/service/pc-management or call 1-866-607-2321. Adachi Computech Solutions, Llc provides customized computer support for home, home office, and small business PC users nationwide in United States, United Kingdom and Canada. The online pc tech support services from https://www.adachicomputech.com/service/tech-support/ are delivered by live technicians using secure screen sharing technology and integrated PC tools via the Internet (remote access). The Internet connection is firewall-friendly and uses 256-bits SSL-encryption sessions, which makes it safe to control and remotely fix the troubled computer while the customer watches and talks with the technician at the same time if the customer so chooses. We sincerely wanted to express our gratitude to all of our clients, including first-time, repeat, and all of you that frequent AdachiCompuTech.com and did take the time out of your busy schedules to drop a line or two about the improvement(s) you would like seen on the site. You spoke and we listened! Now that we have updated and re-launched AdachiCompuTech.com, we want to update you on the new changes you will see as you visit the site. You will notice that we have added a console for registration and login. This combo console is available at the top right hand corner of the homepage and on all the other pages of the site. If you are logging-in for the first time, you will be required to create a free online account by clicking on “Register Now” button and completing a short form. Upon approval, you will receive a “Welcome to AdachiCompuTech.com” e-mail notification. From now onwards, you can login to access your online profile, schedule a new service request, view the status of the services requested, post feedback comments, view technician comments, view and pay invoices, and much more! We have made the process of scheduling a new service request a snap. To schedule an initial or subsequent service request(s), you simply login to your online account using the e-mail address and password you created during registration, and then you click on “New Service Request” to initiate the process. You will need to select or create a profile for the computer needing the support, by clicking on ‘Setup a New Computer’ or by pre-registering it using the ‘Add/Edit Computer’ link. Once completed, you describe the problem, select your desired service type, and submit. We review your service request and contact you to discuss the options available to you and to take credit card payment that covers the initial 1 hour minimum of work. A qualified technician will then contact you to confirm the service appointment. You will notice that we have created a listing of the Frequently Asked Questions available on the Client Resource Center and other locations throughout the site. We have created the option for you to search technicians by entering your zip code and clicking on “Go” button. This option enables you to view and schedule a new service with a technician you have previously worked with. As we strive to provide you with exceptional service and support on a daily basis, we invite you to share your recent experience with us by clicking on this link.